Tokyo and Fukuoka, Japan, August 15, 2016: Fujitsu Limited and Fujitsu Kyushu Network Technologies Limited (collectively "Fujitsu") today announced the start of sales in Japan of their Sewer System Flood Detection Solution, aimed at reducing the damage from torrential rain and flash floods. 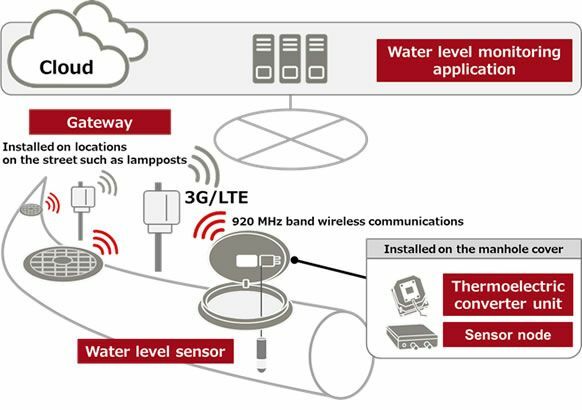 This solution uses a sensor attached within a sewer manhole to collect water-level data, and wireless communications that transmit this data to the cloud every five minutes(1) . The sensor is powered by a thermoelectric converter that turns energy from temperature differentials into electricity. The converter, developed by Fujitsu Kyushu Network Technologies, extends the time between battery replacement from 10 months with the sensor being powered by batteries alone, to five years(2) . This means that in addition to making it possible to achieve dramatic operating efficiencies, deployment costs are also kept in check as power supply installation is unnecessary. This solution can quickly detect sudden rises in the water level in drainage pipes, enabling rapid measures to limit damage resulting from flooding accompanying locally concentrated downpours. In addition, accumulated water-level data can be useful in evaluating sewer drainage plans and setting system-renovation plans. In recent years, higher levels of urbanization and numerous instances of torrential downpours have caused increasingly extensive flood damage. There has also been a demand for the rebuilding and expansion of drainage systems and faster data collection as flooding countermeasures. In particular, under Japan's Flood Control Act, which was revised and put into effect in fiscal 2015, water-level notification systems have been established for areas neighboring drainage systems, such as underground shopping malls. One method for measuring water levels in drainage pipes uses fiber optics; however, it is necessary to lay dedicated cables to the measuring point, requiring high deployment costs. Meanwhile, in the method involving the installation of battery-powered water-level sensors to the bottom of manhole covers, frequent battery changes are required, creating an issue with maintenance costs. The solution's hardware was commercialized by Fujitsu Kyushu Network Technologies, based on R&D by Fujitsu Laboratories Ltd. and a fiscal 2015 field trial with the city of Koriyama in Fukushima prefecture. This solution limits systems deployment and operations management costs, and contributes to reductions in damage caused by flooding of drainage systems. Power is supplied to the water-level sensor and sensor node by using a thermoelectric converter that transforms energy from fluctuations of the manhole cover's heat into electricity. As a result, battery replacement is unnecessary for a period of about five years, under normal conditions. In addition, by miniaturizing and improving the efficiency of the converter, it is the first such unit that can be directly attached to a manhole cover. Water-level data collected by the sensor is transmitted to the cloud via a gateway installed near the manhole. Sensor installation points can be selected freely from among existing manholes, without a power source or the laying of fiber optics, so deployment costs can be kept down. Moreover, the frequency of water-level measurements can be modified to meet weather and location characteristics. From the manhole, the system regularly collects and aggregates pipe water levels, and graphs the information on a map in the water-level monitoring application in the cloud. Persons responsible for disaster prevention in the local government can check water-level data for each manhole through the internet in their web browsers, and can immediately notify local residents of flood information or take countermeasures to limit damage in the event of flooding. On-premise service availability planned for fiscal 2017. With default settings, transmission every five minutes during rain and once an hour with fair weather. Calculated based on the results of the field trial carried out by Fujitsu Laboratories in Koriyama, Fukushima Prefecture.